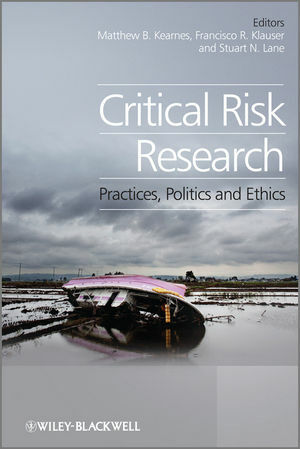 Risk Research: Practices, Politics and Ethics offers a collection of essays, written by a wide variety of international researchers in risk research, about what it means to do risk research, and about how – and with what effects – risk research is practiced, articulated and exploited. This approach is based upon the core assumption that: to make a difference in the study of risk, we must move beyond what we usually do, challenging the core assumptions, scientific, economic and social, about how we study, frame, exploit and govern risk. Hence, through a series of essays, the book aims to challenge the current ways in which risk-problems are approached and presented, both conceptually by academics and through the framings that are encoded in the technologies and socio-political and institutional practices used to manage risk. In addressing these questions, the book does not attempt to offer a model of how risk research 'should' be done. Rather, the book provides, through illustration, a challenge to the ways in which risk research is framed as 'problem-solving.' The book's ultimate objective aims to increase critical debate between different disciplines, approaches, concepts and problems. Dr Matthew B Kearnes, Institute of Hazard and Risk Research, Durham University, Department of Geography, Durham, UK. Dr. Francisco R. Klauser, Assistant Professor, Institute of Geography, University of Neuchâtel, Switzerland. Professor Stuart Lane, Faculte des geosciences et l'environmnent, Institut de Geographie, University of Lausanne, Switzerland.